The ballot was a beginning, not an end. Tuesday night was a victory. 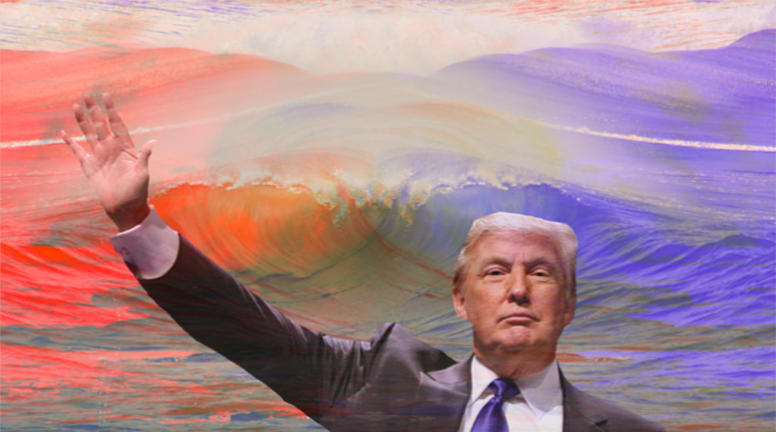 American media tends to overcorrect in the name of a false balance that caters to the endless caterwauling of conservatives, and there were some rumblings that the much ballyhooed “blue wave” washed out in spite of a torrent of good results for Democrats. But the real story of November 6th, 2018, was a tale of conviction triumphing over cynicism. In all 50 states there was real cause for hope, and, at last, a legislative bulwark was thrown up against Trump’s heinous agenda. But let us first deal with the night’s disappointments. It would be the height of foolishness to read the losses of Andrew Gillum and Beto O’Rourke — as some have suggested — as an indictment of values-based campaigning. They fought extraordinarily close races, with O’Rourke winning votes in places Dems haven’t been competitive for a long time and his coattails were long enough to contribute to that House victory that we’re all celebrating. “Moral victories” don’t win close votes in the legislature, but there’s a lot to be said for how close these races were fought and what they portend. In Florida, Gillum’s campaign almost certainly buoyed a voting rights initiative that restored the ballot to felons, ending a uniquely American injustice in that state. If that battle was winnable, even as Gillum himself fell short, that portends victory down the road. Leftists and progressives always face stiff headwinds. Status-quo bias isn’t merely psychological, it distorts political trends as well. Our road is always uphill, always rock-strewn, always stormy; what we face is never easy to overcome. But what 2018 demonstrates is that we are winning an argument and winning allies in the long fight against reactionary politics; even where we lost, these were narrow losses that spooked those in power, losses that came perilously close to pouring over their ramparts. And then there are the many, many places we did win. Convincingly, and with ideals and identities that put the lie to so much conventional wisdom. The Democrats’ victors on election night managed to run the extra yard that candidates like O’Rourke couldn’t; that we’re so close to the line in either direction is a portentous victory in its own right. We must never forget: a close race in a hitherto Republican state or district is still something to celebrate. In the U.S., which doesn’t make “swings” a critical feature of election reporting, ordinary voters may not be informed of important trends in their electorates—trends that are lost in winner-take-all reporting. The swing against Republicans was convincing, dampened only by gerrymandering, partisan chicanery (especially in states like Georgia), and a Senate-electoral structure deliberately designed to thwart sudden changes in the popular mood. But there is so much more to celebrate: Native American women taking their seats in a House that legislated against them for centuries, Black women marching to Congress for the first time in certain districts, Muslim women greeting us in Arabic as our representatives, trans people decisively defeating an initiative that would have curtailed our rights in Massachusetts, voting rights restored to millions, marijuana and nonpartisan districting legalized in Michigan; this all matters in profound, life-changing ways. It is worth remembering that, by design, the race for the House constitutes a national referendum in a way Senate races cannot. To be sure, all elections were local this year — many Democrats triumphed by aping Danica Roem’s focus on local issues, district by district, state by state — but the House, by its very nature, also reflects a national mood. As I write this, The New York Times had the Dems winning the popular vote by over 7 percent, and turnout was breaking records. As hard-right Republicans from Kansas to Wisconsin fall, it feels like there’s a convincing answer to Bannon’s agonized question. Trump’s nakedly nationalistic and racist appeals have profound limits when the public is organized. That brings us to election night’s ultimate lesson — and the words I’d have written no matter what the results were. What the hour demands is power: the building of it, the securing of it, the wielding of it. I had no patience for the cynicism of those leftists who, with an unbecoming eagerness, all but pissed on the utility of voting. But the more reasoned among their number were quite right to say that a ballot was a beginning, not an end. Combatting Trumpian fascism demands more than a willingness to wear a sticker after a state-sanctioned exercise; it commands us to honor the stranger, shelter the refugee, break unjust laws, and fight for what is truly moral, even if that fight takes you into the streets. The work neither began nor ended with the canvassing for Election 2018; so much more remains to be done. Trump’s troops are still at our southern border; innocents still languish in detention centers nationwide, ferried by planes that cross our vast landmass; the dignity of your fellow citizen is under threat from coast to coast. There will be dark hours that demand sit-ins and late night phone calls to make bail for the unjustly incarcerated, or nights where you may have to shelter someone in your home who is unjustly pursued by the state. The chimes of that fateful clock will sound, and you must answer. The Democrats have a bumper crop of officials now. A legion of new legislators, and governors who, for the first time in years, represent a majority of Americans. But voting is about choosing who you will struggle with, and the next two years will be a test; these new Democratic pols won’t mean a damn unless they’re relentlessly pressed to do the right thing. That will, in turn, demand everything from protests to petitions. Above all else it demands your continued engagement. It demands more than the unbecoming, supine posture adopted by Democratic leadership Tuesday night; we need a willingness to fight, not adherence to spreadsheet politics. There is no “marketplace of ideas,” as Speaker-elect Nancy Pelosi would have it. There is, lamentably, only a battlefield before us. On October 27th, I woke up to my partner, who sat bolt upright in bed. She didn’t speak in soothing tones, none of the kind indulgences that normally greeted my sleepyheadedness; she was glued to her phone and told me that a synagogue in Pittsburgh had been attacked. I had the unhappy task of informing my other partner by text. Both are Jewish. I had already been reeling that week from news of the criminally underreported Kroger shooting, which saw a white supremacist attempt to massacre worshippers at a Black church. Thwarted by a locked door, he went to a nearby supermarket and killed two Black shoppers. Now, his ideological twin murdered eleven worshippers at the Tree of Life synagogue. Each was enlivened by the white supremacism that Trump has so thoroughly vivified these past two years. We talk so often about the stakes in any given election. Days before most Americans went to the polls, I saw the stakes drawn in the blood of my own communities. People who could have been my friends, colleagues, loved ones, were gunned down across the land by Trump’s ideological children; there was never any compromising with this, never any intellectualizing to be done. This was never an election with two equal sides, much less two equally survivable sides. I could keep trying to persuade you that last night constitutes “good news,” athwart so much media hand-wringing. But as I think back to the aftermath of that bloody week, I recall a quote — stitched together from different ideas in the Talmud — that has, mercifully, found currency among many progressives. It serves as a reminder of our obligations, regardless of election returns, and remains a polestar for our times.